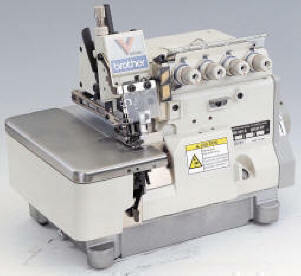 The N-series Brother overlock machines concentrate on a basic range of functions with stable sewing finishes and a maximum sewing speed of up-to 7000spm. 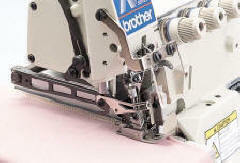 The N-series produces a stable seam from the sewing start to the sewing end, with optimum thread feeding for a wide variety of different materials and threads. 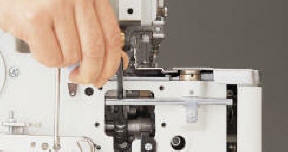 The needle bar mechanism, the upper looper mechanism and the feed mechanism are all fully-closed. This eliminates the problem of oil leaks, and thus protects the material being sewn against staining from oil. It also prevents dust and other foreign articles from getting into the mechanisms. The light presser foot pressure and improvements to the feed path mean that the materials is fed gently, so that no feed marks or damage are left on the material. The components are lighter in weight and have been adjusted for balance in order to reduce the required torque, so that operation is smooth right from the sewing start. In addition, all components from the drive shaft through to the needle mechanism have been optimized for balance to reduce vibration even further during sewing. The four different upper looper paths provide a high degree of responsiveness to different material types. You can be assured of always obtaining the ideal level of sewing stability for all materials from extra light materials to extra heavy materials. Quick responsiveness to changes in specifications and gauges. The position adjustment of the main feed arm and differential feed arm, and the adjustment of the double chain stitch looper are possible from the rear, enabling easy maintenance and responses to specification changes.